Once the limited B&T P26 has run its course, the GHM9 can be seen as its replacement. 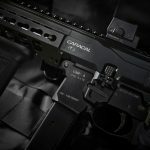 The cost will be about the same as the P26, with an anticipated cost somewhere between the CZ Scorpion EVO3 pistol and the SIG-Sauer MPX pistol. While it looks like a B&T KH9 upper on a P26 APC lower, it is internally different than the KH9, which itself is a DA/SA firearm. 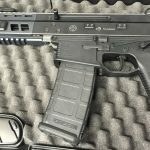 All I’ve got is this teaser photo right now, in the form of an SBR. Shown here first! 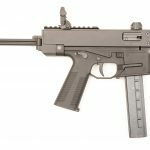 The only mention of the GHM9 I could find was on a Swiss firearm dealer’s website. Personally, I like the experimentation within a single class and I look forward to trying out the different models. Wrong info. The lower is from the APC9, not the P26! Thanks for the picture though!